As I mentioned previously I signed up for Walktober through my employer. 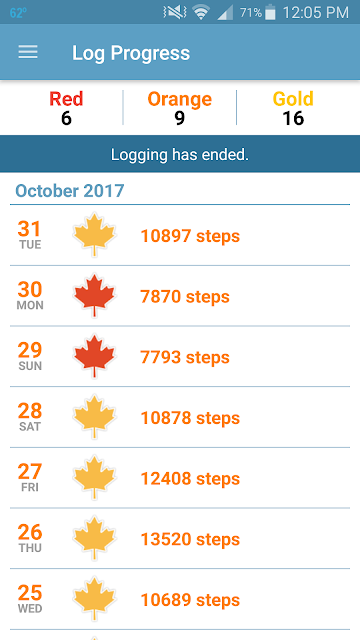 I didn't join any teams or go on any of the Monday Mile group walks (because of scheduling conflicts and rain), so all it amounted to was logging steps every night before bed. To complete the challenge you needed to have a minimum of 6,000 steps per day. Only one day was I concerned about that fairly low bar and did a little extra running around the kitchen with my son. I wore my Fitbit more conscientiously than usual, but I didn't bother to figure out how biking affects my step count. 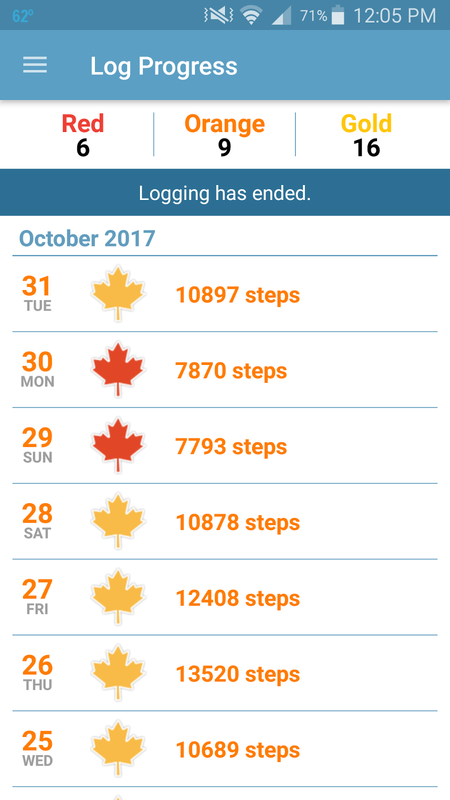 As you can see I had 16 days at the Gold level, which is 10,000 steps or more. That pleases me. In the end, it didn't really encourage me to be more active (except for the one day). I think I'm already aware of the importance of being active, and while I don't make the time for "exercise" these days, I still do a lot of moving about (toddlers, yo). I know I have plenty of good hiking days in front of me. Those are some good steps.